First Class Watches, the UK's top-rated watch website, has recently launched its first ever TV advertising campaign. The TV ad campaign launched onto screens in early December looking to capture potential Christmas gift shoppers and will continue to run into the January sale period. The promotion is expected to reach more than 1.5 million viewers and is currently being shown on a wide selection of channels including More4, Dave, Really, Discovery, Discovery Turbo, Discovery Science, Gold, Shed and National Geographic. The advertisement itself is a 30-second promotional clip which highlights their outstanding choice of over different 5000 branded watches to choose from. The new F150 Satellite GPS watch from Citizen is then showcased as an example of some of the exciting new technology on offer. The ad then focuses on a few of their unique selling points such as free next day delivery and the company’s impressive selection of five star customer reviews. The advertisement is available to view on YouTube. 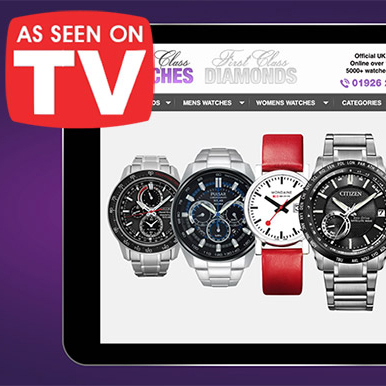 First Class Watches has already been featured in publications such as Stuff, GQ and Tatler and has industry leading reviews on websites such as Trustpilot, Google Certified Shops and ResellerRatings. Their first ever television campaign represents the ambition of all those involved in the team following another successful year online. Established in 2005, the website has become one of the UK's largest dedicated online watch retailers as authorised stockists of more than seventy watch brands. It has been their passion since launch - to create an internet business with fantastic customer support and product selection. Now having accomplished this, they are working to grow the business and heighten awareness with their first ever national TV advertising campaign. Launched in 2005 by high street jewellers James Moore & Co, First Class Watches is a family owned and operated business who have used the power of internet retail to reach customers from all corners of the globe. More than ten years on, they are one of the UK’s largest independent watch retailers with hundreds of thousands of happy customers. Using their responsive website customers can browse a stock of over 5000 watches and more than 70 designer watch brands at their leisure. First Class Watches uses self-photographed 360 degree imagery, product reviews, price matching and free watch adjustment to allow customers to make an informed and quick purchases while receiving the same service and warranty they would expect from a retail store. For more information please contact press@firstclasswatches.co.uk or visit www.firstclasswatches.co.uk.